A brief historical exposition introduces the history of the mansion and the municipality and the development of the families who owned the mansion. 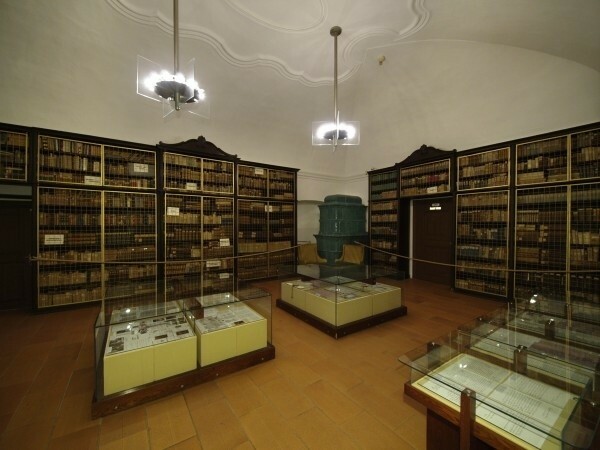 The beginning of the significant Slovak historical library, which is a part of the national cultural heritage, dates back to the last quarter of the 16th century. The library has developed continuously for 400 years and today it has approximately 8,500 books, magazines and maps. The humanists enriched by new values the idea of collecting books for their own use and pleasure and that of others in their milieu, which was known and cultivated from the times of ancient Rome. The sharing of books with friends, but also engaging in discussions about them and exchanging opinions constituted an internal need and moral obligation. Sibi et amicis of bibliophiles was not an empty phrase but one of the deepest values of Humanists. This principle also stood at the origin of the library of the Horváth-Stansith family at Strážky. Its origin was directly related to the founding of the humanist comprehensive school at Strážky for children of the aristocracy of the Spiš Region at the family chateau in the last quarter of the 16th century. Marko Horváth Stansith, a native of Gradec, Croatia, who in 1551 obtained Strážky from Ferdinand I for his efforts in the protection of Sihoť Castle during the anti-Turkish battles, was the founder of the Horváth-Stansith family in the Spiš Region. Just as Marko became famous as a soldier, his only son Gregor (1558-1597) the first deputy district chief of Spiš in the family, became well known in the field of science and education. Family members in the next seven generations were only occasionally involved with the military. The most significant figures were of an intellectual orientation. In addition they were significant feudalists of the Spiš Region; one of the family members was always the deputy district chief of the Spiš Region and several were active as judges as well as school and church inspectors. Like the rest of the aristocracy from the Spiš Region, language proficiency was characteristic for them. In fact, it was quite high, even in comparison with the aristocracy on the pan-Hungarian scale. Their broad cultural scope also arose from this fact. As early as the16th century, the family belonged to the followers of Protestantism, which played a key role in the orientation of education to Germany and affected their overall cultural orientation. Gregor Horváth Stansith, the son of the founder of the family in the Spiš Region, studied for several years at German reformation universities. After completing his studies, he attended the best known European universities. Upon his return to Strážky, he established the comprehensive school (gymnasium) (1584), where he taught, led seminars and did research. Since the library culture played a significant role in these activities, he donated large sums in order to establish a library which became one of the best in Hungary at that time. After Gregor's premature death in 1597, his son Baltazár (1596-1678) continued in this activity. From 1622 - 1624, he was the deputy district chief of the Spiš Region. He studied at Wittenberg and upon his return he led the comprehensive school, taught and extended the family library. The family kept the school for approximately 127 years. Up to the end of the 18th century it was known in the Spiš Region for its charity and patronage, especially towards the lyceum in Kežmarok, in the form of financial and book donations. In the 17th century, the family founded a gallery which was gradually developed. In the 18th century, they also owned a noteworthy numismatic collection, which was brought to the family by Anna Mária Hellenbachová, wife of Gregor Horváth Stansith (1708-1766) the daughter of "Galen of Hungary," the personal physician of Leopold I.
Imrich Horváth Stansith (1737-1801) was an important figure in the history of the Spiš Region. He was the most significant Spiš feudal personality of that time; from 1796 to 1801 he was the deputy district chief of the Spiš Region, and deserves much of the credit for the improvement of the library. He was friend of Adam F. Kollár and Jozef Bencúr. At that time, the library was also used to educate his nephew, Gregor Berzeviczy (1763-1822), the first political economist in Hungary. His uncle was in charge of his education even before the beginning of his studies at the comprehensive school at Kežmarok. As an adult, Gregor Berzeviczy frequently contributed to the qualitative growth of the library as a result of his travels through Europe. In 1801, the male line of the family died out. At first, the property passed to the ownership of the Szirmay family and later the Mednyánszky family (the second half of the 19th century) through inheritance. Andrej Szirmay, husband of Anna Horváthová-Stansithová, experienced the French revolution in Paris. Upon his return to Strážky, he allocated part of the land to the local population. His son Baltazár (1793-1856), the grandfather of Ladislav Mednyánszky, was an educated and unusually well-read individual, who proved himself as expert in purchasing books. However, unlike his ancestors, he did not enjoy a significant position in the social hierarchy. Mária Anna, Baltazár's only daughter, was married to Eduard Mednyánszky of Beckov in 1851. After her father's death in 1862, she moved with her family to Strážky. 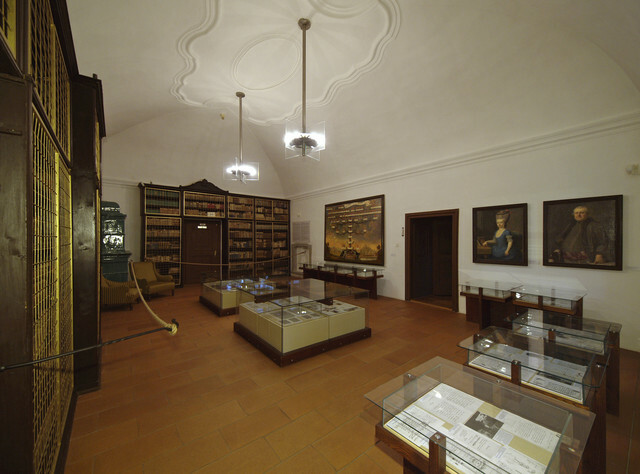 The library played a significant role in the education of their children - Ladislav (1852 - 1919) and Margita (Miri) who spent most of their childhood in Strážky. The rich library, the work of several generations who developed sensitivity, education and fantasy, belonged to the romantic environment of the chateau, from the windows of which one could see the evening star, sunsets or the winter landscapes bathed in moonlight, as well as the garden and game park and beautiful natural surroundings. During the winter months, when Strážky seemed to be twice as remote from European cultural centres, books helped the inhabitants of the chateau/family to overcome isolation and loneliness and gave them the feeling of participation in European culture. The library was always the place of evening meetings of the family and friends. Ladislav Mednyánszky returned here throughout his life. From 1894 to 1896 he deepened his knowledge at the library of Strážsky in the field of history and philosophy. Štefan Czóbel, husband of Margita (Mira) Mednyánszka, author of several works of philosophy and aesthetics, was the last member of the family to use the library for research purposes.